"Nina Antonia's The Greenwood Faun is a haunted, haunting work. Summoning up Lucian Taylor, the hallucinated hero of Arthur Machen's The Hill of Dreams, Nina channels the curious, captivating story of what happened to Lucian's literary masterpiece after his death, and how it both saves and destroys those who come across it after it is posthumously published. Shot through with decadence, poetry, opium, and incense, with the ghost of Lionel Johnson as psychopomp and the Great God Pan heavy in the fields, this is a beautifully written proem: witty, crepuscular, enchanting, surprising." 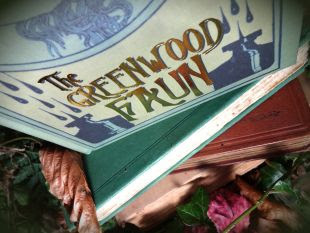 Egaeus Press are now taking orders for The Greenwood Faun by Nina Antonia, a novel of the Eighteen Nineties. We asked the author to answer a few questions about the book. What drew you to the Eighteen Nineties as the setting for The Greenwood Faun? It’s a sublime period for literature and art, steeped in dreams, decadence and romantic notions. Like a particularly potent perfume, it was very heady. There was a unique flowering of talent, including Yeats, Beardsley & Wilde, although I tend to favour those who might be considered ‘minor’ as rather more intriguing, for example Lionel Johnson and Ernest Dowson and the artist Simeon Solomon. The corner had not been turned into modernity as we understand it. It was this strange juncture where central London still had fields and one could see both horses and early motor cars on the roads. The 1890’s was the era of peacocks with a green carnation pinned to their lapels and haunted poets possessed of a dangerous taste for absinthe. It was also tinged with melancholy, as if they knew they were holding on to something that couldn’t last. ‘The Hill of Dreams’ couldn’t have emanated from any other time, even though it was published in book form, after the century had passed, almost like an elegy. ‘The Greenwood Faun’ is similarly a lament for a very lovely but ephemeral era. On the face of it, Arthur Machen and Lionel Johnson may seem very different characters. But did you see some shared affinities between them? They both possess a very strong Celtic influence, responding to the landscape with the soul. Lionel spent some of his formative years growing up in Wales. His family owned a great crumbling mansion in Rhual. Johnson loved taking long walks, getting lost in wild countryside, hearing what the breeze was saying. Although Machen and Johnson were very different characters, both related to mystical, ancient themes and desired to go beyond the surface. They were searchers for the transcendent, explorers of the mysteries, believers in the supernatural. Was it daunting to follow in the footsteps of these literary figures? How did you preserve your own voice? I simply couldn’t shake the idea of what happened to Lucian Taylor’s manuscript at the conclusion of ‘The Hill of Dreams’. Rightfully, ‘The Hill of Dreams’ has been described as ‘The most beautiful book in the world’. I’ve re-read it every other year for over a decade so I think it worked its magic on me and I didn’t have a choice but to write ‘The Greenwood Faun’. Also the character of Lucian, an outsider who moves to London, who tries to make it as a writer and gets lost on the way has a poignancy that overlaps with Lionel Johnson. People who don’t have strong anchors, who are poetic and a little misty can get swept away. Writing has always been a vocation rather than a career. ‘The Greenwood Faun’ pulled me along and whispered in my ear but I wrote as an observer rather than a participant. London is a strong presence in your novel. Do you regard the city in the same way as Machen, as a place of secret byways and curious quarters? Certain London streets still have a Victorian resonance, especially at particular times of the day. Twilight is lovely as it gives a sense of infinity. Machen had an almost psychic sensitivity to his surroundings, which as an author is invaluable. Everywhere is haunted by the past but picking up on it is becoming increasingly difficult. In London, there seems to be a fear of standing still because if you look beneath or beyond, you might catch a glimpse of a greater purpose. That’s what is so perfect about Machen’s ‘A Fragment of Life.’ He captures the young couple’s yearning for something more, whilst they are trapped in the mundane city life. There are certain areas, say Tottenham Court Road, which used to be full of character and individuality, but are now utterly dystopian. Corporate architecture is incredibly disempowering, it pits humanity against inviolate might. Gentrified areas are similarly hollow; the challenge is in finding those odd little undiscovered avenues and forgotten lanes. The themed walk on the last ‘Friends of Arthur Machen’ meeting in London proved amply, however, that with a little research and imagination one can still find curious little walk ways into the past. A cobbled street mentioned in a story, a tiny public garden, a statue of Pan, they are still there. The couple from Bedford Park in ‘A Fragment of Life’ are long flown, just like the family in ‘The Greenwood Faun’ who I imagined lived in one of the grand houses that lead from Kensington to Portobello. Timothy J Jarvis has commented (in Faunus 36) that the novel is among other things “an engaging family saga” with a handful of convincing but well-differentiated characters. Did you find you had to hold back any of these from taking over? All the characters behaved very well, fortunately. Because this was my first novel, I wondered if I should devise a plot–structure. Apparently J.K Rawling spends forever creating great detailed strategies but as I can’t even plan a few hours ahead that method was unworkable. However, the characters assembled very quickly and quite naturally, like players on a stage. This seems to be the Stephen King method, to have your characters lead you. There were a couple of minor instances where I wasn’t sure what would happen next so I imagined a conversation with whoever was being awkward, only to discover that I was out of sync with them, not the other way around. The Greenwood Faun offers a world of old bookshops, rare editions, recondite literature. Is that a sphere you enjoy yourself – and can it still be found today? The fascination with old bookshops and bric-a-brac relates to growing up in Liverpool, where there were some wonderfully dusty yet enticing emporiums, these grandiose but moth eaten repositories of era’s past. I still have a lovely print of Daphnis & Chloe that I bought when I was 18. Untidy little treasure troves have gotten harder to find especially in London but I take the bus everywhere and in the far flung suburbs and backwater streets, they can be found. There in the box behind the paintings that no one likes and the stack of gramophone records that no one plays, if you are lucky you might just find a stash of books that no one wants but that mean everything to you. I did just find a wonderfully ‘graingerised’ book at a local charity shop, a book of poems of Alice Meynell given to Ethel Herdman (lovely book plate) by her uncle Frank, in 1914. The book contained a drawing of Ethel and two beautiful WW1 Christmas cards. I’d like to imagine that in 50 years’ time, someone might find a copy of ‘The Greenwood Faun’ in a strange little shop, with keepsakes between the pages.